Fun & Inspiration What Do Your Fingernails Reveal About Your Personality? What Do Your Fingernails Reveal About Your Personality? Some of our smallest personal habits, like how we keep our fingernails trimmed, our finger length, or even the natural shape of our fingernails can reveal more than you might guess about our unique, individual personality traits. In this article, we will look at some of the reasons that our fingernails can reveal our inner personality and what your fingernails say about you. In grade school, it used to be a joke that you would ask someone to look at their fingernails and if they turned their hand with their fingernails pointing toward themselves with their hand curled, it meant they were feminine, but if they looked at their hand with their nails pointing toward the other person it meant they were masculine. Boys tried to catch girls doing this the ‘wrong’ way for their gender and vice versa, and then used that as another reason to tease. The research shows that on average, males have a relatively shorter index finger compared to their ring than females do. The theory is that the finger length ratios of the index finger and ring fingers are related to the amount of estrogen or testosterone that a baby receives in the womb during development. The Canadian study also revealed that there was a connection between depression in men and the length of their fingers. They found that a more ‘feminine’ ratio of finger length was related to depression in men. Other studies have found a connection between a shorter index finger in men and ADHD symptoms, alcohol dependency, autism, aggressiveness, leadership, tendency to be a psychopath and other traits. For women, a shorter index finger is connected with risk of anorexia and assertiveness. A longer ring finger than index finger for women was linked to bulimia risk, neurotic behavior, psychopathic behavior, visual memory, and verbal skills. * Fan shaped or Triangle shaped with the point down (wider at tip) – ‘Fan shaped’ nails with a narrow base that widen out towards the top of the finger like a fan are associated with a personality that is anxious and high strung. * Almond or Triangle point up (wider at base) – Fingernails that are wide at the base and narrower at the tip are associated with a personality that is gentle, creative, more refined, and emotionally sensitive. * Tall rectangle – Long fingernails are reported to mean that the character will be prone to selfishness and narrow-mindedness. * Square – Square fingernails are relatively equal in length and width. People with square fingernails reveal a person who can be ‘tight-fisted, mean, and stingy.’ This shape of fingernails also reveals a tendency towards impatience and quick thinking, and the shorter the fingernails, the more critical the personality. 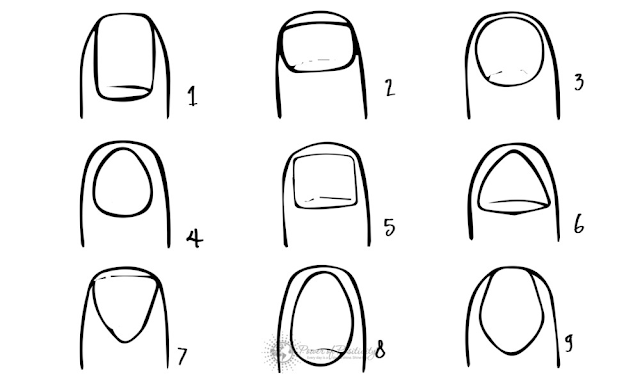 * Oval or round – This fingernail shape tends to be the most positive, open-minded, and happy. A rounded fingernail shape is creative, independent, and a quick learner. * C-shaped curving down – This fingernail shape indicates a personality that is hard working and has had to overcome an obstacle in the past. This fingernail shape reveals a person who is perseverant and courageous. What we call our fingernail is actually called the nail plate in anatomy. The nail plate itself is made of the protein keratin, which is produced by the nail matrix near the cuticle of the fingernail. The part of the fingernail, which is attached to the nail bed is pink in color because we can see the blood vessels of the nail bed. The free edge of the fingernail is white in color as the fingernail grows beyond the nail plate. According to Bianca Maria Piraccini, author of Nail Disorders: A Practical Guide to Diagnosis and Management, on average, fingernails grow about 3 millimeters per month. Nail growth slows as we age and is fastest in early adulthood. Excessive filing, biting or picking at your fingernails can be the cause of fingernail health problems. Often, these behaviors may be an outlet for extreme stress for a person. Nail biting is a habit that children often outgrow by their early adulthood. Continuing to chew your nails may be a sign that anxiety or stress is becoming overwhelming to you and you need an outlet. In extreme cases, nail biting can become an obsessive-compulsive personality disorder when thoughts of nail biting and the need to chew them interfere with daily activities or results in negative mood.